NEW YORK It came oh so close. Economic data and company reports reflected an economy beating investors' low expectations, rather than one growing like gangbusters. Impending government budget cuts also cast a pall for some investors. "There was no dramatic, great news," said Leon LaBrecque, CEO of LJPR in Troy, Mich. "There's no remarkable economic information. Earnings are pretty much mixed." It took a decisive turn upward in the early afternoon. Around 2:30 p.m. EST, it hit 14,149 - just 15 points from the Oct. 9, 2007 record of 14,164.53. The Dow ended down 20.88 points, or 0.2 percent, to 14,054.49. The Standard & Poor's 500 index slipped 1.31, or 0.09 percent, to 1,514.68. The Nasdaq composite index edged down 2.07, or 0.07 percent, to 3,160.19. 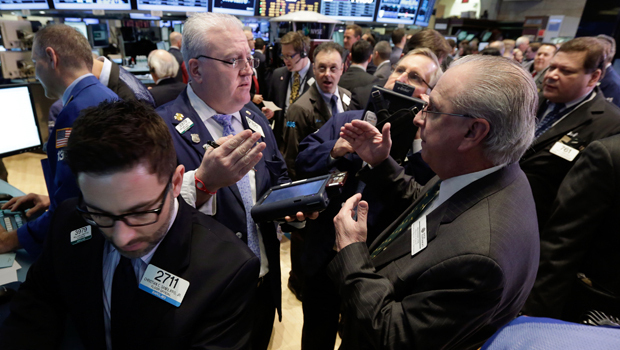 Some said the market's fleeting gain Thursday was more about its general tendency to rise over time, and not necessarily a reflection of a surge in strength for the U.S. economy. "People have to separate the economy from the stock market," said Ed Butowsky, managing partner of ChapwoodFinance.com in Dallas. Thursday's data didn't provide a clear picture on the economy. Company earnings were mixed. J.C. Penney (JCP) and Barnes & Noble (BN) posted losses. Wendy's (WEN) and Domino's (DPZ) had higher profits. The U.S. economy grew at an annual rate of 0.1 percent in the last three months of 2012 - better than the original estimate of a 0.1 percent decline, but hardly robust. The number of Americans seeking unemployment aid fell, and the government prepared for federal spending cuts to kick in Friday, a result of Democrats and Republicans not compromising on the budget debate. "We still have work to do, still a lot of headwinds to face," said Steve Sachs, head of capital markets at ProShares in Bethesda, Md. But, he added, "we're in a better position now than we were three years ago." Thursday's close means the Dow rose 1.4 percent in February - respectable, but a slowdown from its 5.8 percent gain in January. The Dow milestone doesn't mean much in practical terms. It's an index of 30 big-name stocks, such as Disney (DIS) and General Electric (GE) that investors follow as a gauge of how the overall stock market is doing. But professional investors don't change their strategy because of it. Groupon (GRPN), the coupons website, plunged 24 percent after reporting late Wednesday that its quarterly loss had expanded. The stock fell $1.45 to $4.53. J.C. Penney fell 17 percent after the department store reported a higher-than-expected quarterly loss late Wednesday. The stock dropped $3.59 to $17.57. Wendy's, Domino's, clothing chain Chico's (CHS) and energy drink maker Monster Beverage (MNST) all rose after reporting higher profit and revenue. Barnes & Noble climbed 3 percent, up 51 cents to $15.74. The bookstore chain posted a loss, though its CEO confirmed that the company was still in talks with its founder about a partial buyout.